We’re midway through blueberry picking season here in Connecticut, and I’ve been taking full advantage of the plethora of berries. 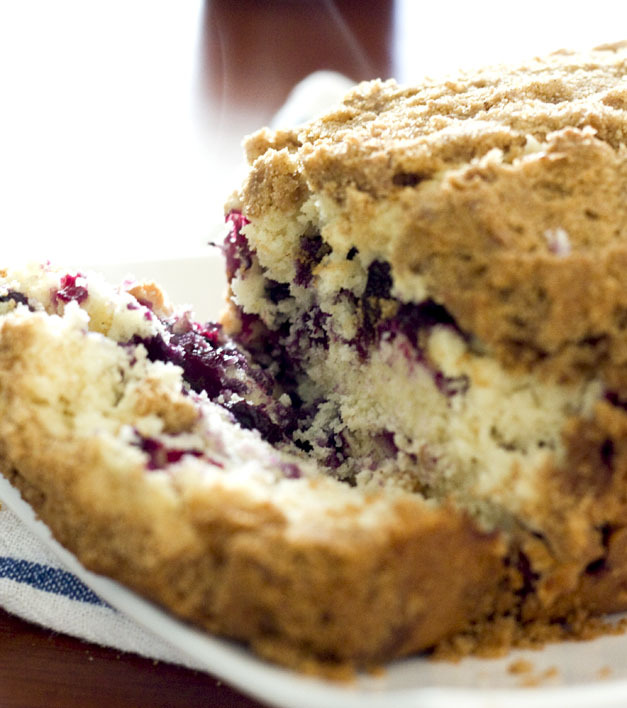 We picked a few pints last week and at the orchard’s store they had some blueberry coffee cake to sample. Ryan and I were won over, and I knew I’d have to try to recreate the delicious and fresh concoction at home. I ended up choosing a recipe from Savory Sweet Life that really turned out great. I actually made this cake as a gift for our friend Rob who helped move all of our furniture. When you own a huge truck like Rob, you’re kind of asking to be recruited every time someone moves. But he was a great sport and I promised to bake him something delicious in return. Of course I had to cut into the cake myself, but strictly for photographic purposes ;) Look at the steam coming from the cake, yummmm! I baked the cake in a regular bread pan, mostly because I don’t own a bundt pan but I think it turned out just as delicious, and would even work in an 8×8″ pan. 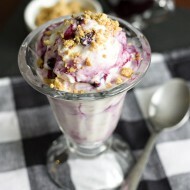 This is a great summer dessert recipe if you have a lot of blueberries around and I highly recommend you give it a try. 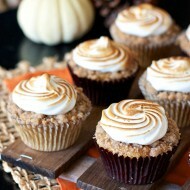 I love all kinds of cinnamony/streusel muffins and cakes so this makes a wonderful addition to my recipe repertoire. – Preheat oven to 350 degrees. Grease bread pan. – In a separate bowl, whisk together salt, baking powder, and flour. Slowly add this mixture to the butter mixture with mixer on medium to low speed. – Bake in the oven for about 60 minutes. Remove from oven and let it sit for about 10 minutes before removing the pan. 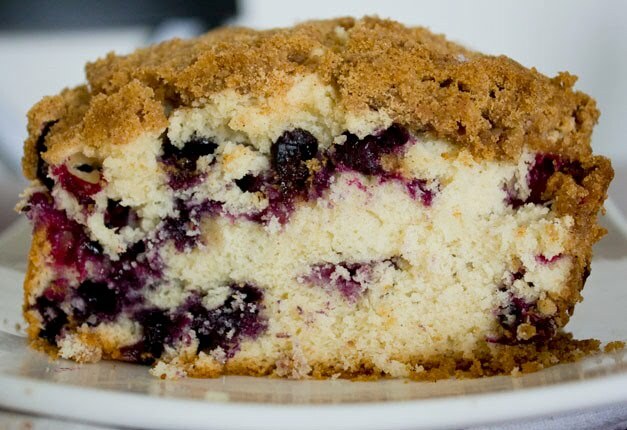 Look at those blueberries studded throughout your cake! This looks delicious. 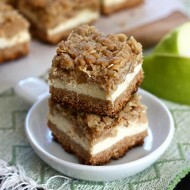 Just discovered your blog though FoodGawker. It’s beautiful and your recipes all sound really good. I’ve added it to my RSS so I can check back regularly. Great stuff! super easy to make! (im)patiently waiting as it bakes and fills my apartment with delicious aromas. yum! can’t wait! came out great…hit the spot on this lazy sunday. so excited to try again when it’s actually blueberry season! I just placed it in the oven now. It smells delicious! I used an 8×8 loaf pan and it collapsed in the middle. This has happened before. Any suggestions? Smells wonderful. Thanks! Maybe I shouldn’t have suggested using an 8×8″ pan because I haven’t actually tried that – but the original recipe suggested that so I passed on the info. Sorry to hear that!! 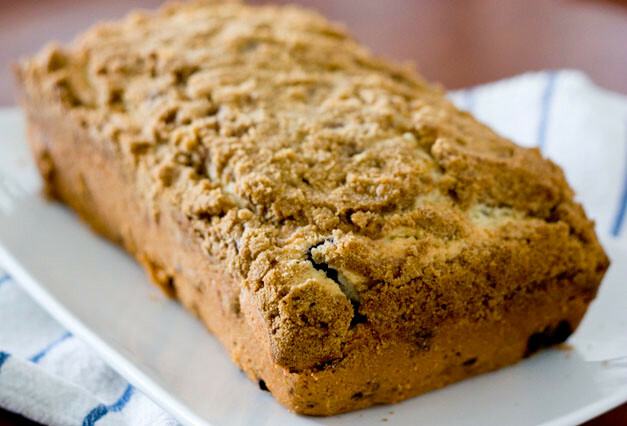 I would try it next in bread loaf pans to see if that works better, as I had great success.